Cars can get cluttery pretty quickly. The easiest solution to prevent candy wrappers from getting between the seats is to buy an auto litter bag. The number of car trash bags available in the market will surprise you. Like most items for vehicles, there is no one-size-fits-all model when it comes to garbage bags. If you are looking for the absolute best car garbage bag, read on to find out the top products that might suit your needs (and car) perfectly. Capacity— This indicates how much trash the litter bag can hold. If you accumulate a lot of trash in your car, you would need a large capacity litter bag. Size— The size is not the same as the capacity. The size refers to the exterior dimensions of the trash bag. This is important to determine whether the trash bag would fit inside your car without disrupting passenger comfort. Installation— Does the car trash bag have a strap that goes around the headrest? Or does it need to be stuck-on with an adhesive? Pay attention to how the car trash bag can be fitted inside for your convenience. Once you get down the above three, you can zero in on a good product. You can get more tips for purchasing a good product in the buyer’s guide below. Why we like it: The TrashStash is amazingly well made and is completely leakproof. What’s more, it has side pockets and fits in any car model. 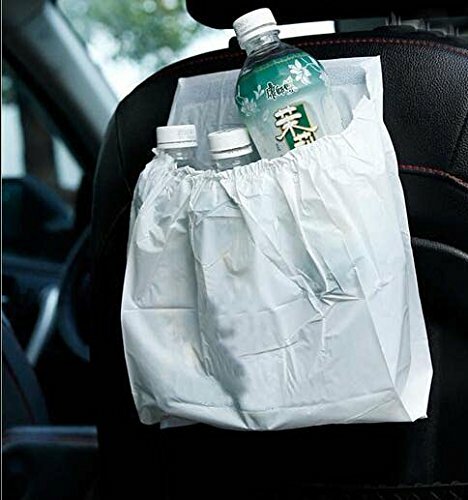 This car garbage bag can be hung on a seat. It’s got many features that drivers will like even if the product is so simply made. This auto trash bag is also amazingly affordable. If you are looking for a superior product to rely on for a long time, then this is very much worth considering. The TrashStash is made from a sturdy synthetic fabric with heat-sealed seams. The bag has an auto-shut feature to keep trash out of sight. The interior of the bag is lined with waterproof material. The fabric won’t absorb any moisture because of this lining. The trash bag for cars comes complete with a buckle and a webbed strap. It cinches around the headrest and keeps the trash bag secure at the desired height level. This car trash bag is completely leakproof. Nothing liquid can get out of this and stain your seats. Even if it’s just a garbage bag, the metal frame gives it a sturdy construction. The bag won’t collapse while hung to a seat. It has a very convenient hinged opening. It’s easy to open and snaps shut so odors are kept out of the car. What’s more, the bag comes with side pockets. You can keep tissue packets or soda cans in the side pockets very conveniently. The canvas type of fabric the TrashStash is made from is very durable. However, it’s doesn’t really hold up very well. The bag may collapse without a frame structure. The lining keeps the water from leaking out. But the lining is not removable. When you need to wash the bag, you will have to wash the whole thing. The waterproof lining is easy to wipe off. However, that can be a bit inconvenient, unless you use a plastic trash bag inside. Still, one of the biggest perks of this trash bag is that it’s very stable. It doesn’t move side to side like most other hanging trash bags. 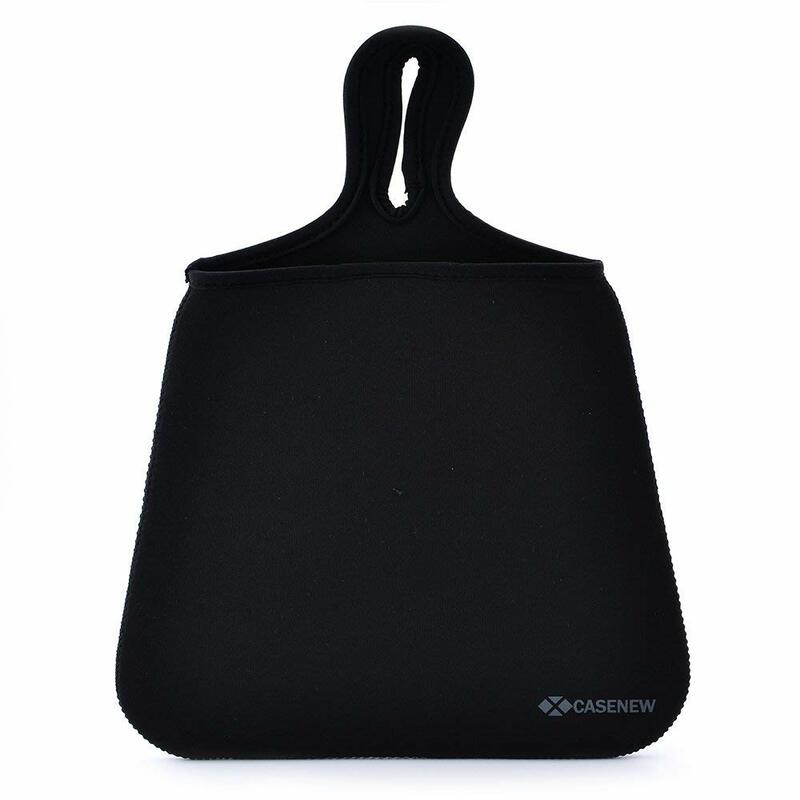 This is a great product that universally matches any car headrest. The TrashStash is well made, is durable, and completely waterproof. Cleaning is a bit of a nuisance, but it’s only a minor worry considering the other perks this auto trash bag offers. It’s well worth the very affordable price tag. Why we like it: Affordable, big, and available with side pockets. This waterproof car trash bag is practically a steal for the budget price. If you are looking for an auto litter bag with a generous size, then this might be the product you are looking for. The EPAuto car trash bag is superbly constructed but costs less than ten bucks. It’s hard to find similar products with this many features for the price tag. The EPAuto is a great catch for those who obsess over car cleanliness. 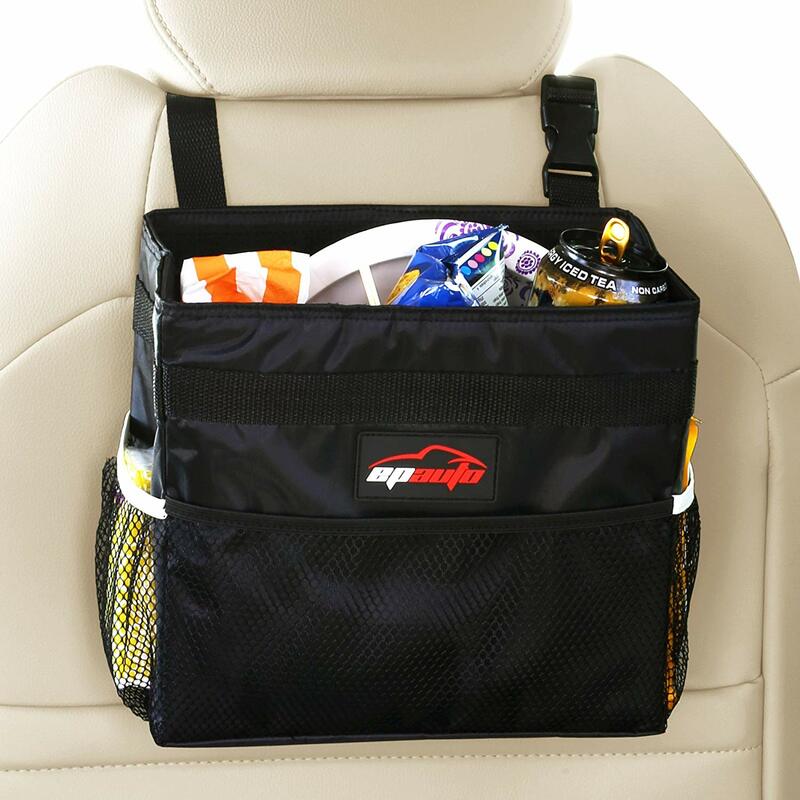 The EPAuto car trash bag is made from black canvas with a lined interior. The inside has a LiquiShield lining that is completely waterproof. The bag can be closed shut with a Velcro seal. It has an adjustable buckle to secure to a car seat. The design of the EPAuto car trash bag is surprisingly simple. However, it’s the perfect auto litter bag for family vehicles that generate a lot of trash. The medium-sized trash bag can be adjusted up to 10 inches in height. It has a number of side pockets to hold cans, tissue, or anything else that needs to be off the seats. The Velcro seal is the perfect solution for keeping trash out of sight. It keeps odors away too. 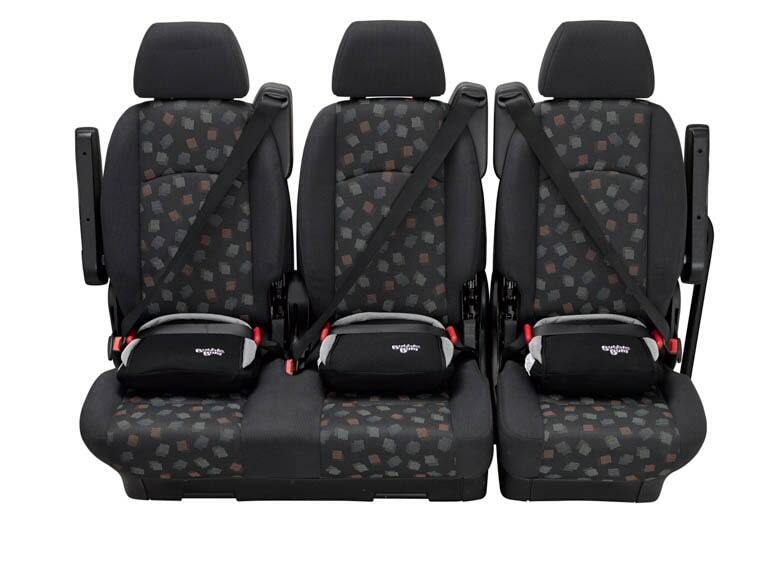 The lining is completely waterproof so the driver and passengers don’t have to worry about leaks. Unfortunately, the lining isn’t removable. You will have to wipe the interior clean. Despite this minor setback, this car trash bag fits most vehicles. Do note that this trash bag is vehicle model specific. It will suit most vehicles, but you will first have to check compatibility levels. Another downside is the lack of base. The bag needs to be hung to the headrest because it can’t stand on its own on the floor. Given the cheap price, this car trash bag is amazingly worth it. It is spacious with wide pockets for holding trash for more than a week. It’s waterproof and leakproof too. The downsides are minor, like lack of base support, which you don’t really need when the trash bag is hung. It would be perfect if the waterproof lining was removable for cleaning. Why we like it: The Ipely car trash bag is highly affordable, small, and requires zero installation. It keeps trash in and prevents any spillage. If you are looking for an affordable, small auto litter bag, this might be the dream product for you. It’s small, near universally compatible, and costs around five bucks. The Ipely may not be perfect, of course. But this is one of the most convenient car garbage bags money can buy. This trash bag is made from top-notch Oxford fabric. This material is known for its durability. It’s shaped much like a small duffel bag that you can hang around a headrest. It doesn’t have an enclosure but comes with a tightening belt adjustable for any headrest. The bottom part of the trash bag has a Velcro seal. It makes dumping the trash out very easy. There are two great qualities in the Ipely car trash bag: price and convenience. This trash bag is as simple as it gets (and also as cheap as it gets). The construction of the bag is really simple. It lacks any wire frame support, but you wouldn’t need that. You can just dump stuff in from the adjustable, round top. Take the trash out by unsealing the Velcro bottom without soiling the top opening. The bag is completely washable and dries easily. One big downside is that the material isn’t specifically waterproof. It won’t hold water inside, but it can contain some liquids without causing leaks. The trash bag is small. It may seem like a big perk to some. But some users may prefer more space. You will need to empty this trash bag several times a week with regular use. Yes, it is durable and very simple and easy to use. What makes it so unique compared to others, is that it has an elastic opening which makes trash stay inside the bag. The Ipely is a highly usable car trash bag that is relatively simple to use. It doesn’t sway and the elastic tightening keeps all trash inside. It’s relatively small and is not waterproof. These are minor downsides compared to the super cheap price. The trash bag is great for holding paper waste that tends to accumulate in between the seats. Plus, the bag will fit inside just about any vehicle model. Why we like it: The Case New trash bag is great for limited-space use. It’s compact and won’t sway during rides. The Case New trash bag is less like a garbage bag per se and is more like a trash pouch. It looks a lot like a compress bag. The design is unique and is well suited for most types of cars. 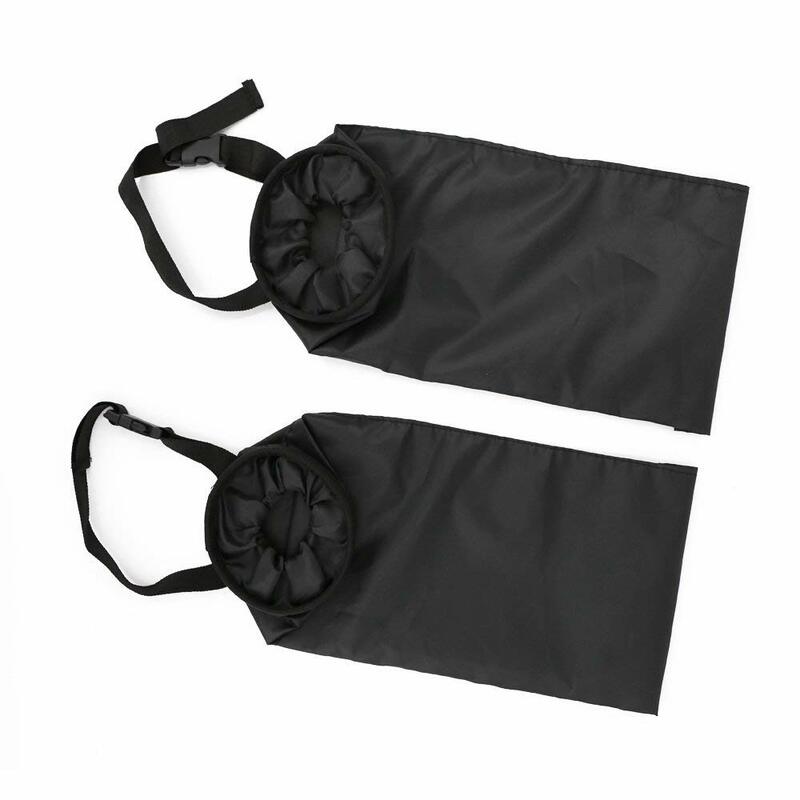 This trash bag is made from neoprene, a synthetic material made from rubber. This material is very eco-friendly and lightweight. It’s different to fabric and is completely waterproof. The bag is shaped like a triangular compress pouch. It sports a compact size and has a Velcro sealed opening. The bag is available in multiple colors and patterns. It’s a wonderful change from the bland black color most car trash bags are available in. It doesn’t have a strap to fit around a headrest. Instead, this trash bag has a small fabric hook opening to fit onto a door. The rubber auto trash bag is made in China but is amazingly durable and useful. The material is completely leakproof so you can shove cans inside. The lightweight bag is washable. It lacks an interior lining because the material is waterproof. You can wash the whole thing in one go. The biggest issue with the trash bag is its small size. You can only put a limited amount of trash in there. It lacks any side pockets and similar space-increasing features. If you want more capacity, you will have to buy multiple bags. It’s great at keeping the trash inside, thanks to the Velcro seal. However, there’s only one opening to put in the trash in and get it out. It’s easy to soil the opening when emptying the trash. But the bag is easy enough to wash each time so this might not be a major issue. This bag doesn’t really hang anywhere in the car except on the hooks on side doors or the window opener. You can use a rope or a belt of your own to secure around a headrest. Otherwise, you will just have to use it pinched between two seats. This product comes highly recommended for those seeking a compact and waterproof car trash bag. If you don’t like those headrest hanging trash bags, this might be it for your vehicle. 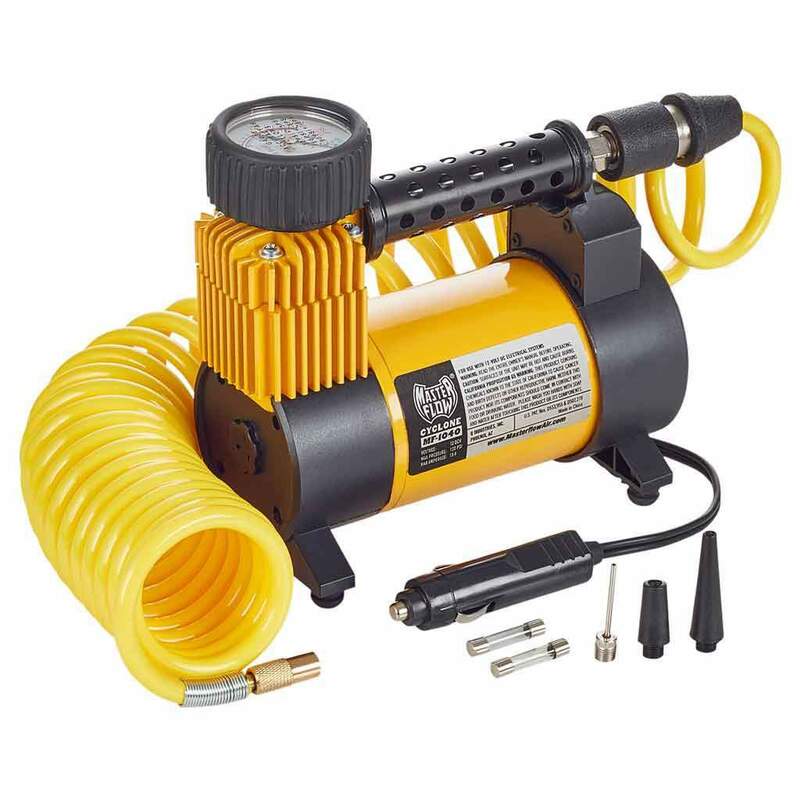 The capacity is quite small, which can be inconvenient, especially on long road trips. The price seems a bit expensive given the small size. But other than these issues, this is a highly usable car trash bag. Why we like it: This large-capacity car trash bag is the perfect product for busy people on the go. Big Ant car trash bag costs around ten bucks. The price is well worth it considering its capacity. This trash bag doesn’t secure around a headrest. So if you are looking for an alternative to that, Big Ant is an excellent option. The square-ish Big Ant car litter bag is made from a rough and sturdy polyester fabric. It has a built-in interior lining that is waterproof. The trash bag’s design has a lid. So it’s shaped like a car trash can, but it collapses if needed. The bag has a 38 cm adjustable strap. 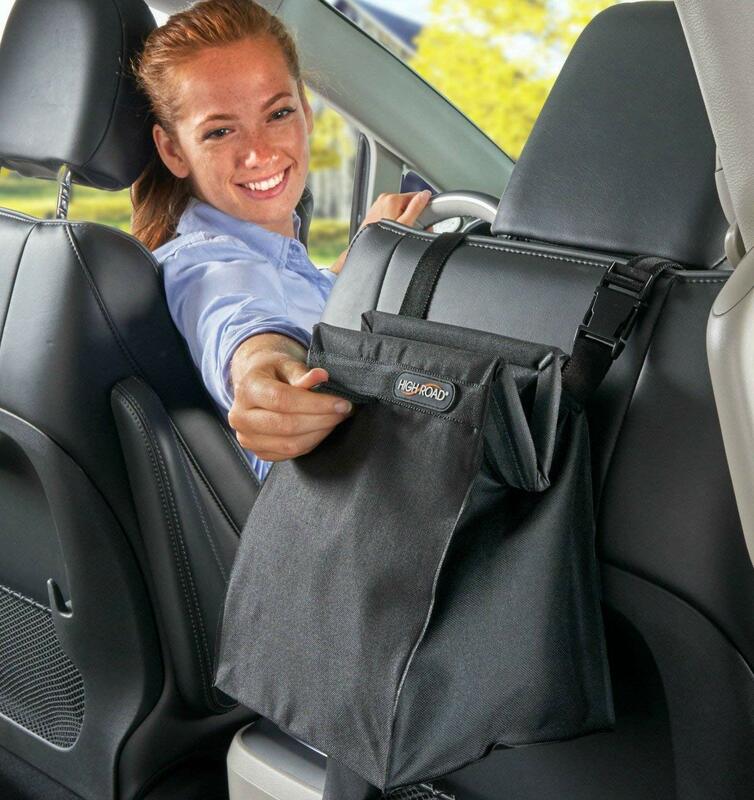 You can fit this bag anywhere inside your car, even if it’s not the headrest. This car trash bag has a massive capacity of 2.5 gallons. It’s also completely waterproof. You can put an open bottle of water inside and it won’t leak a drop. The trash bag also has three side pockets for keeping wrappers, tissue paper, or hand sanitizer as you like. The capacity makes this auto garbage bag really worth the price. It’s great for family vehicles where the interior can get cluttered really easily. The trash bag comes with a long strap so you can fit it into a side door or the headrest. The versatility for fitting the trash can is really great. If you want to keep it out of side near the doors, the strap will come in very handy. It has a small lid to keep the garbage out of sight. The lid has a small Velcro seal. The lid doesn’t completely close, however, and that’s the only major complaint. The lining is inbuilt, so you will have to use an extra plastic trash bag if you want to remove the trash without washing the bag. The interior lining can be wiped clean. But the best way to clean it is to wash the bag. The biggest perk of this car trash bag is that it supports a massive capacity. It’s reliably waterproof and doesn’t cause any leaking whatsoever. You can also install the trash bag just about anywhere in your car. Because of these qualities, this product is amazingly useful. Why we like it: These eco-friendly car trash bags are super affordable, leakproof, and are very easy to remove and dispose of. Think of the simplest definition for a car trash bag, and this is it. These generic trash bags are the car version of those plastic trash bags you may have in your kitchen. These bags are disposable and quite affordable. If you don’t like hanging massive trash bags on a headrest, this might be the product you are looking for. These car trash bags are made from calcium carbonate mixed in with starch. The bags look just like white plastic trash bags. However, these are biodegradable and not at all detrimental to the environment like plastic bags. The bags are quite small. Each comes with a part with sticky tape for securing the trash bag on a surface like a dashboard. Each package contains 30 pieces of trash bags. The typical retail price is around $10. If you are a vehicle owner who doesn’t care much for cleaning trash bags, then you may like these. These small trash bags are easy to install, remove, and get rid of. Because the bags degrade in about 80 days, you won’t have to worry about polluting the environment. These trash bags do not have straps or drawstrings to hang around anything. Instead, there’s a small sticky tape. Remove the safety strip and a bag will be ready for installing. The bags easily stick to plastic-like surfaces of the car like the dashboard. It will stick relatively well to leather, but don’t expect these bags to stick to headrests with fabric coverings. The stickiness doesn’t come from regular glue. When you remove a bag, it won’t leave any residue. The bags are quite small so the capacity is very limited. You can put in some paper trash and a crushed soda can or a paper cup in there. The maximum weight that these bags can hold is three pounds. These disposable car trash bags are the perfect alternative to plastic. There’s no cleaning mess. You can just discard the bags with the trash. The bags are limited in capacity, and that’s the only issue. These trash bags would be perfect if you don’t accumulate lots of trash in your car. Why we like it: These compact bags are available in highly affordable packs of two. If you are on a budget, these 2-pack auto litter bags would be the perfect purchase. The trash bags are compact, but you get two for a price less than ten bucks to increase capacity. The UTSAuto trash bags are made from high-quality Oxford cloth. The bags have wire-rimmed circular openings with elastic adjustments. Each trash bag has a strap for securing around a headrest. The bottoms have Velcro seals. Despite the dirt cheap price tag, these car trash bags are made from high-quality material. These look like pouches except for the circular top. The capacity of the bags is limited. You can put in a lot of paper waste, but only a single standard soda can. But there’s two so you won’t run out of space that easily. The trash bags are really easy to secure around a headrest. The Velcro bottom is super convenient to empty the trash. These trash bags are highly compact, so these are best for small vehicles. The bags are quite versatile too. You can use one to store items other than trash. The UTSAuto litter bags are leakproof, but not wholly waterproof. The bags can keep some liquid inside, but not too much. Each bag is washable too. Cleaning and installing is really convenient with these. These trash bags are as convenient as disposable ones but in a very reusable manner. These are adequate for small cars or non-family vehicles. The bags have limited capacity but are leakproof. The price is really affordable so there’s nothing much to complain about. 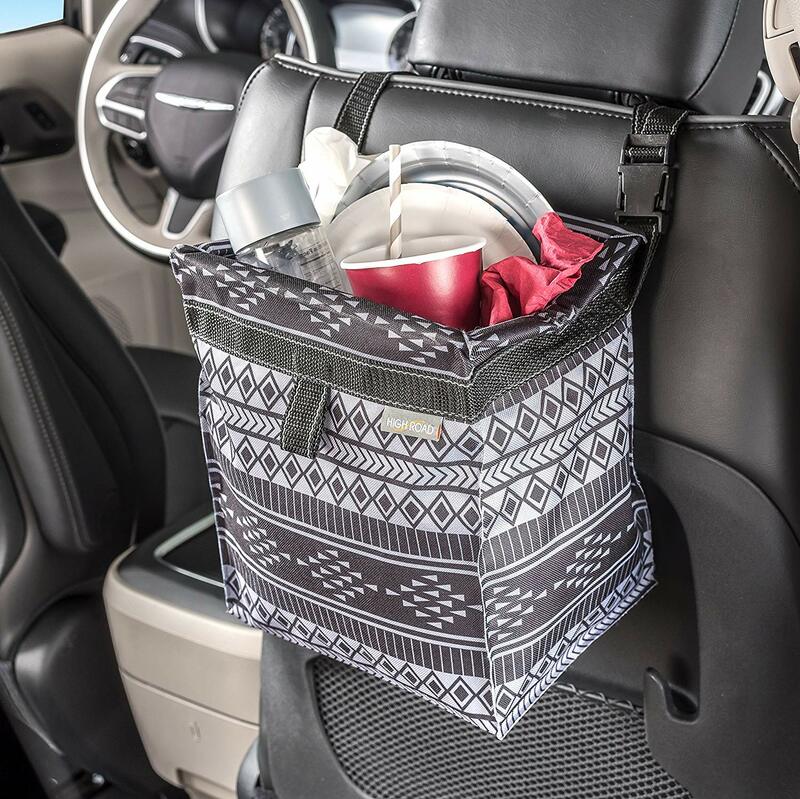 Why we like it: The gorgeous print makes this trash bag more like a highly useful in-car decoration and less like an unsightly regular trash bag. The High Road TrashStash bag is very much a high-capacity auto litter bag. But that’s not the main reason to love this. Unlike regular black trash bags that look like in-car dumpsters, this one is available in stylish Baja prints. If you like your car interior to look fancy even down to the trash bag, then this product is well worth considering. This car trash bag is made from 500 denier polyester. This is a heavy-duty fabric suitable for doing some heavy lifting without breaking. 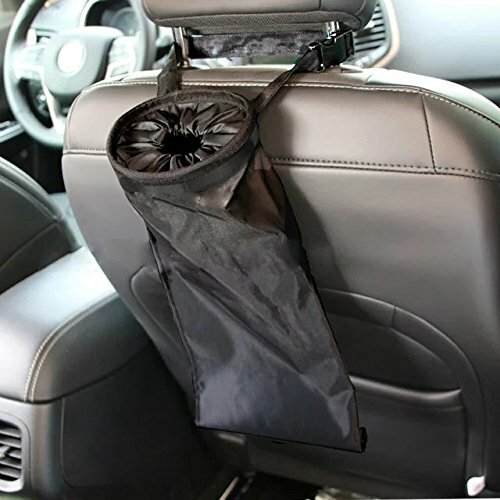 These massive capacity auto litter bags are made to hang from a headrest. The bag is made with heat sealed seams, so it’s perfectly leakproof. The bags have a spill-proof liner inside. You can expect these American-made auto trash bags to hold up to 3 gallons of garbage. The bag has a hinged, spring-frame supported opening. You can close the bag to keep trash out of sight. The trash bag even comes with a quick-release buckle for dumping the trash. The straps are reinforced and webbed to ensure stability. This car trash bag is unique in how stylish it looks. The exterior print is absolutely charming to look at. But looks aren’t the only thing that’s going for this trash bag. 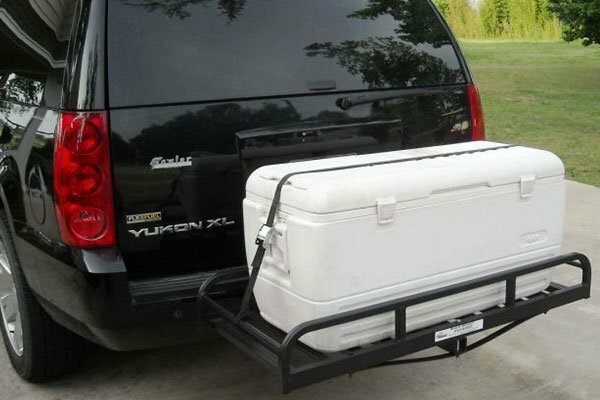 It supports a massive capacity and is made from sturdy material to hold heavy weights. You can easily strap this around a headrest. The bag will prevent any spills. However, it’s not completely waterproof. This trash bag can be closed. But if you fill it up to its capacity, it won’t close and the trash will be visible. The lining is inbuilt so you don’t need to use anything else extra to prevent spills. However, this makes cleaning a bit complicated. This is a top-notch car trash bag best suited for those who seek style as well as capacity. The leakproof, heavy-duty trash bags would certainly keep trash off seats. But do keep in mind that the style comes with a price. Costing close to $20, you may find much cheaper products that can perform just as well. Why we like it: These stick-on disposable trash bags are spacious and are perfect for car owners who don’t want to be bothered with weekly cleaning. Tired of cleaning reusable auto trash bags? Sick of seeing large trash bags sticking out of the headrest? Then these disposable trash bags are certainly worth considering. These are minimal maintenance and are relatively affordable. Each of these disposable car trash bags is made from biogas material. These look plastic, but according to the manufacturer the bags degrade in 80 days. The small bags have a sticky strap for attachment. The bag’s opening is elastic to better hide the trash inside. These garbage bags are moderately sized. You can easily put in used tissues, candy wrappers, and maybe a soda can or two inside. The mouth of the bags is elastic. Once the trash is shoved in, it will be kept mostly out of sight. However, these bags don’t entirely close and don’t prevent odors from leaking out. The stick-on straps are relatively adhesive. They stick on well to plastic and solid parts of the car like armrests and dashboards. However, these are not as sticky as they should be. The adherence to seat covers, even leather ones, is pretty shoddy. The bags are leakproof but not waterproof. You will have to be careful not to put too many things inside because the weight might cause the stick strips to fall off. These disposable trash bags are near perfect. The bags could do a better job of sticking to seat covers, but in general, the adherence and performance are acceptable. There’s no mess involved with using these. You can use the bags anytime you like on the go and dispose of them whenever needed. For about ten bucks, you get 30 bags, so the price is very affordable. As far as disposable trash bags for cars go, these are some of the best. Why we like it: Simple and colorful trash bags are well-suited for cars thanks to massive capacity and leakproof-ness. These are the simplest types of car garbage bags money can buy. These bags are available in rolls in multiple colors. You can buy up to five 8-gallon rolls for around $16. The price is very reasonable considering the amount of product you get. These plastic trash bags are made from pure PE material, meaning plastic. This plastic is highly durable and doesn’t break easily. Each trash bag is considerably large. You can expect one of these to hold between 5 to 8 gallons of trash. The bags are designed as regular trash bags and are available as rolls. The bottom has an integral forming to prevent leaks. 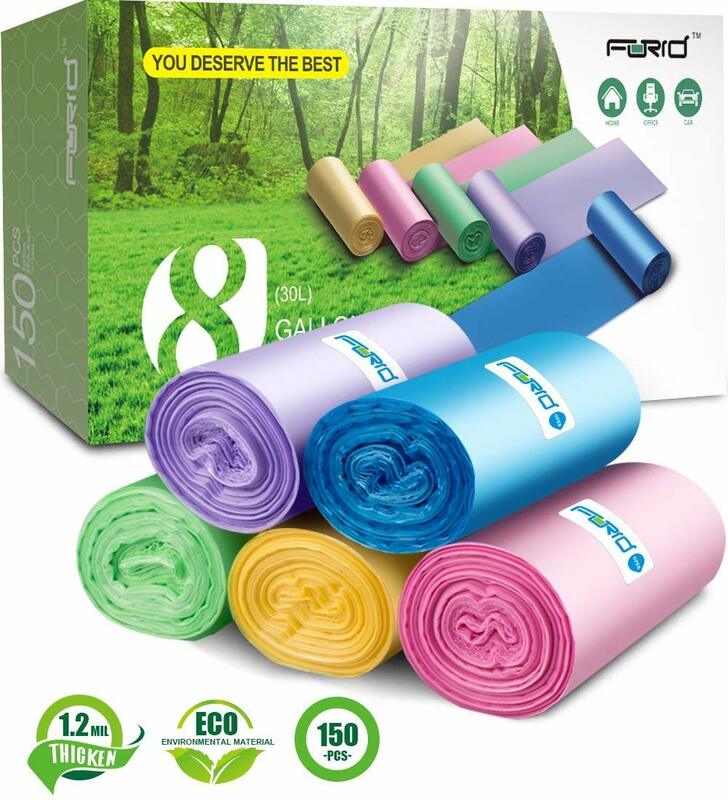 The rolls are available in five colors: green, blue, yellow, pink, and purple. The rolls have non-elastic openings. These trash bags are made for both in-car and home use. You can use one in any car but the trash bags don’t come with attachments. If you have a trash bin for your car, you can use one of these bags as liners. Each bag is leakproof and easily disposable. You can use one of these bags without a trash bin or a can either. But you will have to lift up the bag off the floor to dispose of trash. The biggest advantage is the capacity of these trash bags, which surpass nearly all attachable trash bags for cars. If you need to dispose of massive amounts of trash in your car, such as on road trips, then these trash bags would come in very handy. The bags are odor-free and are great at trapping smells inside. The material is plastic, but is more eco-friendly than regular plastic, according to the manufacturer. Don’t expect these multipurpose car trash bags to be like regular trash bags. These are disposable, but don’t come with any attachments. It’s possible to come up with a custom way to attach one of these bags to your car. Otherwise, you will have to keep one on the floor. If you want a large capacity disposable car trash bag, then this would be perfect. These bags are also great to use as liners for trash bins or fabric bags you keep in your vehicle. Don’t give only a passing thought to buying a trash bag for your car. You might come to regret your decision. Most auto litter bags cost less than $20. But don’t let the cheap prices distract you. You can make thoughtful decisions even with auto litter bags. Auto litter bags fall into two main categories: disposable and reusable. Disposable trash bags for cars are made from plastic or an eco-friendly equivalent. You use these trash bags once and then you can throw the bag away with the garbage. Reusable car trash bags can be used with liners. These bags aren’t as unsightly as plastic bags. Some reusable bags have in-built liners to make them waterproof or leakproof. You may not need to use liners at all. Reusable car trash bags can be washed and used as many times as you like. This is obviously the most environmentally-friendly option. But if you don’t like washing trash bags, you can use a biodegradable disposable car trash bags. However, don’t expect disposable products to have a large capacity as reusable bags. It’s up to you to decide whether you want a reusable car trash bag or a disposable one. Assess your needs and make a decision. 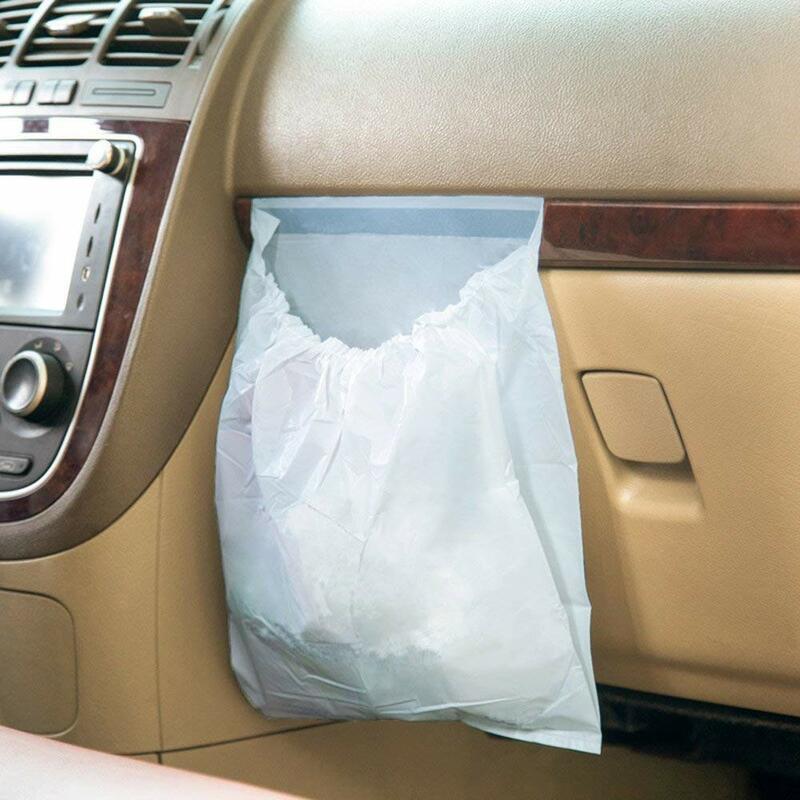 You would definitely want a car trash bag that doesn’t cause any nasty leaks. There are plenty of leakproof and waterproof auto garbage bags that will keep even liquid trash tightly sealed in. But do be aware that there’s a difference between the two terms. A leakproof car trash bag is largely leak-resistant but is not entirely waterproof. 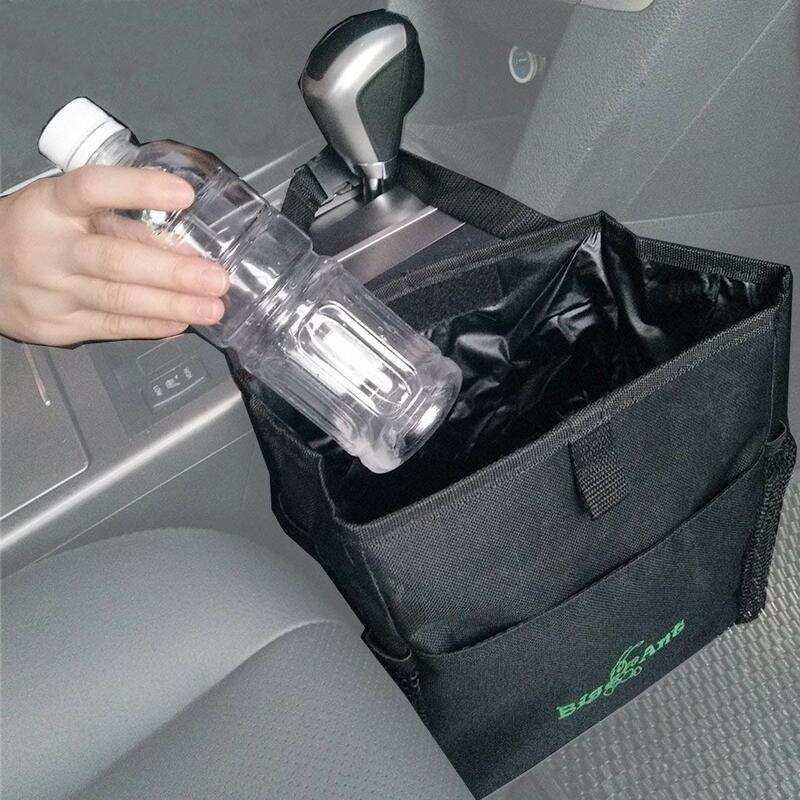 A waterproof car trash bag can hold even a liter of water inside without causing spillage, leaks, or breakage. A leakproof bag cannot do the same. Therefore, don’t conflate the two terms. If you want zero leaking at all, the best option is a waterproof car garbage bag. The capacity refers to how much trash the garbage bag can hold. Determine this depending on how much trash your car accumulate over a week. If you have children traveling with you to and from school, buy a large-capacity auto litter bag. These bags can hold 2 or 3 gallons of trash, including multiple soda cans. A small car trash bag is suitable for just one or two passengers. Keep in mind that larger trash bags are more conspicuous. You might also want to consider how spacious the interior of your vehicle is when you buy an auto garbage bag. For example, a large-capacity car trash bag that fits on a headrest may cause problems for passengers in the back seat. For small cars, a compact car trash bag is the best. Make sure the trash bags you purchase don’t stick out too much or take over passenger space. Car trash bags can either be hung from the headrest or a door. Stick-on versions can be stuck to seats, armrests, or the dashboard. Choose which installation method is best suited for your needs. Most car trash bags wrap around the headrest. If you prefer interior comfort and free space, you can choose a cat trash bag that can be draped across the door. It’s important that the bags says in place well, of course. Look at the material the trash bag is made to determine durability and other important factors. Reusable car trash bags are made mostly from synthetic fabrics. Some are very sturdy and can hold heavy weights without breaking. Disposable auto litter bags are mostly made from PE plastic. But you can choose an alternative biodegradable version too. The material the trash bag is made from will tell you how durable it is and whether the advertised weight is actually supported in practice.